Welcome to the April edition of the Greenfox Newsletter. Spring has sprung and the Greenfox Team is hard at work connecting with communities, working with students, and perpetuating our mission for a greener future. Read on to find out more about our latest projects and upcoming events! Greenfox will host a table at this year’s EarthFest on the promenade in Boston. Earthfest is a free event hosted by Radio 92.9 offering live music from popular bands, countless vendor tables presenting educational displays, exhibits, food and product samples, as well as kid-friendly activities, including the Kid’s Planet Stage. Greenfox Schools will be sponsoring a table for the day and have several craft projects to entertain your kids while educating them on the environment. Join us May 21st for a fun-filled and family-friendly day of activities. Then, celebrate the start of summer the following Thursday at Kitty O’Sheas, where we will hold our own EarthFest party! Click here for more info on these two exciting events. Cambridge Greenfox students have spent time outdoors this month exploring the Greenspace right in their back yards. The students watched New England come to life, observing bugs, planting seeds, learning about trees that are native to the area, and preparing for Fresh Pond Day. Fresh Pond Day is an event on Sunday, May 7 at the Fresh Pond Reservation in Cambridge, MA. All are invited to enjoy and explore this wonderful natural space, rain or shine. The event includes story telling, nature walks, scavenger hunts, and much more. Greenfox Schools will be at Fresh Pond Day helping people pot trees to take home to grow. For more information on the event, click here. In an informative and fresh approach to describing the word “sustainability,” Kristen von Hoffmann, Founder and Chair, writes about sustainability and the role of sustainability in education. Click here to read the article in full, and to see pictures of Greenfox Schools programming, activities, and students. We hope that you enjoyed our April Newsletter. Don’t forget to visit us online at http://www.greenfoxchools.com to learn more about the organization and to find out how you can get involved! Taking what he learned from his experiment, No Impact Man Colin Beavan offers 42 tips to move toward a zero-waste lifestyle. Together with his family, Colin Beavan—aka No Impact Man—spent a year trying to live in the middle of New York City without having a negative impact on the environment. One of his first challenges: getting through everyday life without producing trash. Below are some of his favorite tips and tricks. No soda in cans (which means we’re probably less likely to get cancer from aspartame). No water in plastic bottles (which means we get to keep our endocrines undisrupted). No coffee in disposable cups (which means we don’t suffer from the morning sluggishness that comes from overnight caffeine withdrawal). No throwaway plastic razors and blade cartridges (I’m staging the straightedge razor comeback). Using non-disposable feminine-hygiene products that aren’t bad for women and are good for the planet. No Indian food in throwaway takeout tubs. No Italian food in plastic throwaway tubs. No Chinese food in plastic throwaway tubs. Taking our own reusable containers to takeout joints (except that now we’re eating local so this tip is out for us). Admitting that we sometimes miss Indian, Italian and Chinese takeout. Hopping on the scale and celebrating the loss of my 20-pound spare tire since I stopped eating bucketsful of Indian, Italian and Chinese takeout. Buying milk in returnable, reusable glass bottles. Shopping for honey and pickled veggies and other goods in jars only from merchants who will take back the jars and reuse them. Returning egg and berry cartons to the vendors at the farmers’ market for reuse. Using neither paper nor plastic bags and bringing our own reusable bags when grocery shopping. Canceling our magazine and newspaper subscriptions and reading online (you can still make a donation to support the media organizations you value). Putting an end to the junk mail tree killing. Carrying my ultra-cool reusable cup and water bottle (which is a glass jar I diverted from the landfill and got for free). Carrying reusable cloths for everything from blowing my nose to drying my hands to wrapping up a purchased bagel. Wiping my hands on my pants instead of using a paper towel when I forget my cloth. Politely asking restaurant servers to take away paper and plastic napkins, placemats, straws, cups and single-serving containers. Explaining to servers with a big smile that I am on a make-no-garbage kick. Leaving servers a big tip for dealing with my obsessive-compulsive, make-no-garbage nonsense, since they can’t take the big smile to the bank. Pretending McDonalds and Burger King and all their paper and plastic wrappers just don’t exist. Buying no candy bars, gum, lollypops or ice cream (not even Ben and Jerry’s peanut butter cup) that is individually packaged. Making my own household cleaners to avoid all the throwaway plastic bottles. Using baking soda from a recyclable container to brush my teeth. Using baking soda for a deodorant to avoid the plastic containers that deodorant typically comes in (cheap and works well). Using baking soda for shampoo to avoid plastic shampoo bottles. Get Colin Beavan’s book ‘No Impact Man’ FREE when you sign up as a Dedicated Friend of YES! Using the plastic bags that other people’s newspapers are delivered in to pick up Frankie the dog’s poop. Keeping a worm bin to compost our food scraps into nourishment that can be returned to the earth instead of toxins that seep from the landfills. Switching to real—meaning cloth—diapers which Isabella, before she was potty-trained, liked much better. Not buying anything in packaging (and count the money we save because that means pretty much buy nothing unless it’s second hand). Shopping for food only from the bulk bins and from the local farmer’s market where food is unpackaged and fresh. Forgetting about prepackaged, processed food of any description. Being happy that the result is that we get to eat food instead of chemicals. Giving our second-hand clothes away to Housing Works or other charities. Offering products we no longer need on Freecycle instead of throwing them away. Collecting used paper from other people’s trash and using the other side. Using old clothes for rags around the apartment instead of paper towels. Talking with humor about what we’re doing because making a little less trash is a concrete first step everyone can take that leads to more and more environmental consciousness. 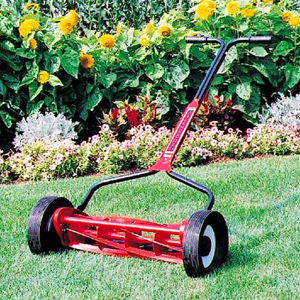 American Gardener: Our popular American Gardener Trimmer and Edger is out of stock and will not be made in the future. The American Gardener was a fine trimmer and provided good value. The company supported the product very well. New Trimmers: We are fortunate to be able to bring two new trimmers to the market. Both use the new lithium ion technology for their batteries. The Recharge Lithium Trimmer -Edger is pictured below. 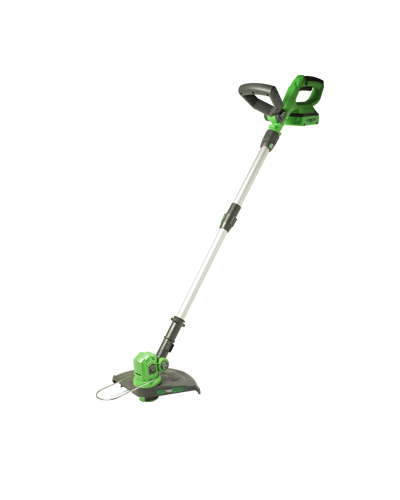 CEL POWERtrimmer: The CEL POWERtrimmer , pictured below, is the other new trimmer we have this season. The lithium-ion battery technology means it will store the charge over the winter months ready for next season’s use. There is no messy petrol or oil to contend with and yet you have all the power you need; even the line feed is automatic, a short amount is dispensed on every start to ensure the full 10” cutting diameter is made. From Time to Time: We are asked about removing the E-Ring on the Silent Cut Reel Mower. To do so, you need a pair of pliers. Pry the e-ring off horizontally by pushing away from the axle against the closed side of the e-ring using a standard flat head screw driver. Try putting a drop of oil or grease on it or spraying it with WD40 to make it easier. If you damage or lose the e-ring we will send you another one at no cost. Replace the e-ring on the Silent Cut Reel Mower by using a large pair of needle-nose pliers. Line the e-ring up in front of the groove. Open the pliers and place one side on the closed side of the e-ring and the other side of the pliers against the far side of the axle. Then close the pliers, snapping the e-ring into place in the groove. It may take a little practice but is fairly easy to do. Put Money Low on the ListPeople who put money high on their priority list are more at risk for depression, anxiety, and low self-esteem, according to researchers Tim Kasser and Richard Ryan. Their findings hold true across nations and cultures. “The more we seek satisfactions in material goods, the less we find them there,” Ryan says. “The satisfaction has a short half-life—it’s very fleeting.” Money-seekers also score lower on tests of vitality and self-actualization. Women and Wheelbarrows: In my time I can’t recall women using wheelbarrows, well maybe I can remember my mom using one once or twice, but not often. Yet, I have seen the Smart Cart used on a daily basis by my wife and daughter. 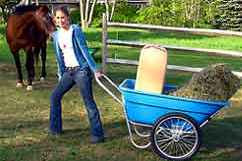 Great for the horse: My daughter, Rose, found the Smart Cart very useful when she would take care of her pony, Meeko. She would use the cart to take hay and food to the horse shed. And she would use the cart when she mucked out the stall. Gardening and Weeding: My wife’s use usually revolves around gardening. The Smart Cart is perfect for transporting plants from the car to the flower beds. Carrying mulch from the car to the beds. Weeding a bed and transferring the weeds to the compost heap. No Question: So if you want to provide an easy way for women to move material, I recommend the Smart Cart. It will get used more than you can imagine. No question about it. 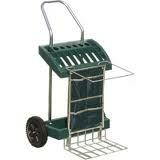 The Vertex Garden Cart: is a wonderful tool holder, organizer, carrier. My Vertex Garden Cart holds shovels, two rakes, a hoe, a weeder, a broom, ice pick, pitch fork, 3 types of garden and pruning shears, trowels and more. When Gardening: The Vertex Garden Cart easily rolls to your garden where you have all the tools you need. Everyone has experienced starting to work and then needing one or two more tools. And then having to return to the garage and get that necessary tool. With the Garden Cart, just make sure you have the tools on your cart before leaving your garage, and you are set for your gardening experience of the day. Extra Space: The Garden Cart has space for small tools in the apron where many tools such as a trowel can be placed. And there is a rack at the bottom where you can add plants or compost to the cart. Best feature: What I like best about the cart is that the tools stay in the same place year round. No more stacking up against a wall or hanging in their places. My tools stay in the cart year round. I always know where they are.